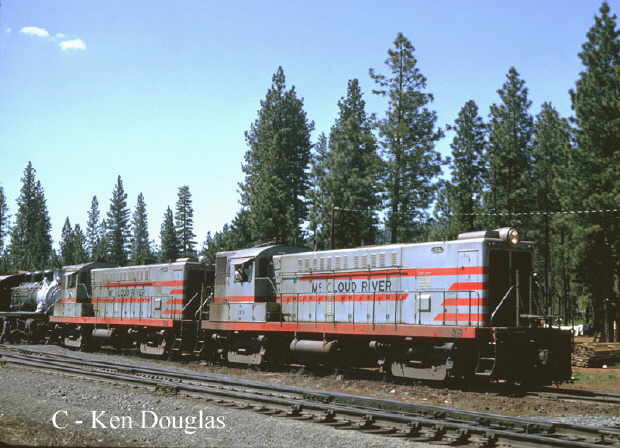 McCloud River Railroad; History: 1963-1977..
#33, the #32, and the #25 in McCloud on 1 May 1964. Photo by Ken Douglas, courtesy of Keith Ardinger. The railroad entered 1964 on a slower pace. Gone were the long trains of logs that used to roll daily into McCloud, along with the Burney switcher. However, the railroad still generated enough revenue off of freight movements to keep the operation healthy. Service over all three lines remained at five days a week, although the freights were much shorter than in years past, and the Pondosa branch was worked three days a week. The railroad provided service to six forest product plants during this period. The largest shipper by far was the U.S. Plywood sawmill in McCloud, and the other shippers included the Scott Lumber Company (later Publishers) in Burney; the Lorenz mill northeast of Burney; the Cheney-Grant Lumber Company in Pondosa; a stud mill just east of McCloud; and a P&M Cedar Products mill in Mt. Shasta City located about a mile from the interchange with the Southern Pacific. The railroad continued to handle sporadic shipments for other businesses, but lumber and woodchips remained as the primary commodity hauled. While the log hauling days ended, the days of the steam powered excursion were taking off. The #25 found itself busier and busier with each passing year as more and more people heard about the McClouds steam program. The railroad initially owned no passenger equipment, as coaches were borrowed or provided by the organization chartering trips. In late 1962 the railroad re-built a pair of log flats with benches and railings for an excursion, and the pair became the first excursion equipment on the railroads roster. Interest in the program rapidly increased, and about 1966 the railroad decided to purchase more weatherproof equipment. A total of three former commute coaches were purchased from the Southern Pacific and moved to McCloud. The McCloud shops re-built two of them into fine excursion cars using some parts from the third and was soon fielding a four car train (usually five or six cars, depending on if cabooses were used). The railroad donated the third car to the Pacific Locomotive Association. The railroad ran a few excursion on its own, but the majority of trips were sponsored by civic and railfan organizations. An average year during this time period saw several trips run, including a few specials to Burney Falls and at least one snow trip in winter. Most McCloud trips were one time or once a year affairs. Two tourist operators did try their hand at regularly scheduled trips on the railroad using the lines equipment. The first was an operation known as the Mt. Shasta Alpine Scenic Railroad that attempted regular operations out of Mt. Shasta City in 1964. The operation did not last. The second was another group of railfans that set up operations between McCloud and Mt. Shasta under the name Shasta Huffen Puff. Shasta Huffen Puff operated a few excursion in 1967 followed by full seasons of operation in 1968-1971. However, rising insurance and train rental costs forced the group to suspend operations after the 1971 season. The McCloud River Railroad was one of several railroads owned by U.S. Plywood. U.S. Plywood was not adverse to using the McCloud River name beyond the traditional boundaries of the McCloud operations. The first such venture came in the mid-1960s. U.S. Plywood owned a paper mill on the Samoa Peninsula west of Eureka, CA. The paper mill had an in-plant switching railroad, and U.S. Plywood elected to make this operation an arm of the McCloud River Railroad Company. The deal did not last long, as soon afterwards switching the plant was turned over to the Northwestern Pacific. The second use of the McCloud River corporate structure outside of McCloud came in 1970. The parent company had a furniture plant in Algoma, Wisconsin that was served by an independent railroad known as the Ahnapee & Western. A 1968 bridge failure left the furniture plant as the only shipper left on the road, and some talk surfaced that the railroad would be abandoned. U.S. Plywood stepped in and purchased the remaining portion of the Ahnapee & Western using the McCloud River Railroad corporate structure to preserve rail service to the plant. Apparently operations of the road were handled by the connecting Green Bay & Western Railroad. U.S. Plywood survived until 1967 when it was merged with Champion Papers Inc. to form U.S. Plywood-Champion Papers Inc. (known as Ply-Champ for short). By the early 1970s the name changed again, this time to Champion International Corp. The various name changes had almost no affect on operations in McCloud. The railroads steam program continued strong through the 1960s. By 1969 the steamer was needing some work and their was some consideration given to ending the program. However, the railroad received enough pleas and support from the railfan community that parts and experienced labor were located to perform the needed work. However, the recession of the early 1970s cut into opportunities for the locomotive to operate, and trips became fewer and fewer. The last runs occurred in 1975 when the locomotive along with a crew were transported to central California to participate in the filming of the movie Bound for Glory. Upon return to McCloud the locomotive was placed in storage.